In this spooky adventure, AJ, Emily, and their friend Freddy are back for more fun. 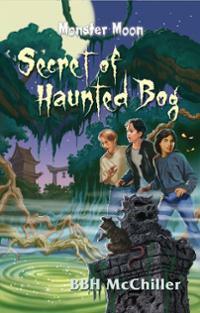 This time they find themselves in a haunted bog outside Chinatown. But is it really haunted, or could it be hiding something? After devouring the first book in the series, my tween boys enthusiastically jumped into this one. They weren’t disappointed. The authors’ unique wit and haunting style continue in the same kid-pleasing manner. The setting is colorful and unique. The characters are old friends. And the plot kept my boys engaged and guessing. And this mom was pleased to find yet a second spine-tickler without any spiritual or gory negatives. Grab a copy for 2.99. Thanks a million, Michelle! You rock! Sounds very entertaining and I love this cover. I will be adding this one to my summer stack of reading and recommendations. Thanks for featuring. Don’t you love it when you find a book that really excites you or your kids. This sounds very entertaining! Thanks for the comments this week and last, guys. Sorry, I’ve been away without internet. This is a fabulous series. Lynn, when is book 3 coming out? In time for Halloween, I hope! This sounds like a great book. It is good to find one that kids really enjoy and can’t wait to read. thanks for the review, I love the cover, too! Thanks for stopping by, Janet. I prefer a more literary style, but my tween boys absolutely ate these books up. The covers are excellent!